Description: Baryonyx assumes a walking posture, with its left leg moved forward and its right leg posed backward. Its tail is not bent as much as the other Bary figures, since this figure's card is large enough to accommodate its overall length. Its back and neck are covered in rows of small bumps, while a single small horn is found on the snout. It is equipped with a whipping action: pulling the right leg back and forth makes the head spin around, as if the creature is thrashing its head. This also features a dinosaur-breaks-free-of-restraint-gear action: when the capture gear is on, the Baryonyx can break free by thrashing its head left and right. Additionally, the beast’s lower jaw snaps back when pulled down and released, making it possible for this sculpt to clasp other figures between its jaws, though the mouth can’t open really wide so most figures won’t fit. This dinosaur figure sports brown colouring on its back, neck, head, upper part of the tail and the very upper part of the limbs. This brown gradually shifts to green, which is located on the flanks and the underside of the creature (belly, throat, lower jaw, lower part of the tail) for the most part, as well as on the rest of the limbs. The figure carries randomly patterned black spots all over its back, neck and upper tail, and features a small black horn between its nostrils, as well as blue circles around its white eyes (with cat like black pupils). The claws on both arms and legs are black, while a black JP logo is found on the right upper leg. The figure also has white teeth and the inside of its mouth, including its tongue, is red. This Bary comes with two pieces of capture gear, which form a sort of harness around the creature’s upper body and restrain its arms and head. However, it wouldn’t stop the creature from just walking away. Both pieces are painted in dark yellow, an unusual colour for capture gear. The Dinosaur Tracker is a broad shouldered, butch looking figure of a man, sporting a brownish yellow field suit with numerous pockets, wearing a brown shirt underneath the suit, brown arm patches, black utility belts, an almost golden ammo belt around his torso, black boots and a pair of black sunglasses. He also has black hair and a Elvis like hairdo. He stands with his legs wide apart in a bracing pose with his left leg stretched forwards and his right leg backwards. His head is a bit too small compared to his body. Pressing his legs together makes his left arm move, so it looks like he’s making slashing moves when holding one of his weapons. He has three different weapons, none of which are capable of action features; these weapons are mere props but they’re much more realistic than most of the weapons that come with human figures. The Tracker carries a stun prod with a cross shaped end, as well as a shot gun and a machete. All weapons are coloured dull grey. Analysis: the first JP: Dinosaurs line introduced a new concept, namely pairing human figures and their accessories with basic dinosaurs instead of hatchlings, making for the bigger dino/human 2-packs of this line (and similar sets for JPD2). For the time this was unique, a little bit of originality in a line consisting solely of repaints. 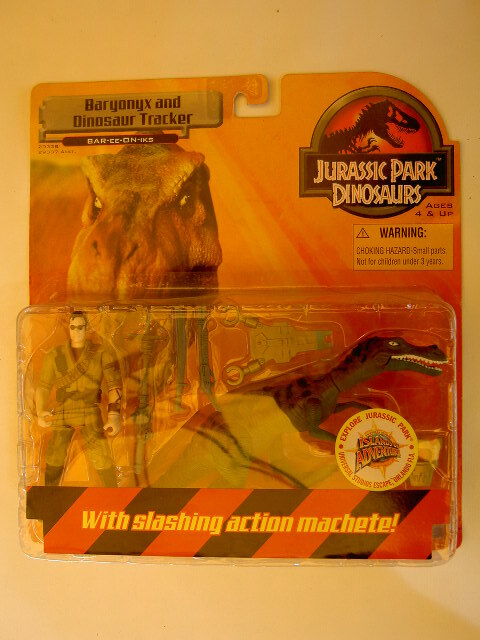 One of the first such sets was this Baryonyx with Dinosaur Tracker set. It's an interesting pairing of figures, though as far as compatibility of action features goes, not the most successful match. The Tracker is too big for the Bary to clutch between its jaws and viciously spin it around, nor is his arm chop movement sufficient to take down the carnivore with whichever of the three weapons he holds. You could say this makes it a draw. As far as the paint jobs go, this is not a bad set. Though the Bary's paint scheme is identical to that of its TLWS2 predecessor, the colouration has improved. Green and brown fits the Baryonyx well, even being reminiscent of the paint job of the old JPS2 Baryonyx. Also, the figure's details have not been forgotten this time: the claws on both hands and feet, the horn on the snout, the inside of the mouth, it's all painted. It even got some extra detailing round the eyes, though these themselves are less pretty, being simply white. Another improvement for this figure is the fact that it's tail is more stretched out due to the bigger packaging, which means that it is better balanced this time around and can stand up on its two legs more easily, while the tail doesn't hit the ground. Unfortunately this is only the case when its capture gear is not applied. The gear itself got a yellow paint job, which makes it stand out among all JP capture gear. It also adds some extra colour to this set. The Dino Tracker paint job is not all that different from the original colouring on TLWS1 Peter Ludlow. It's somewhat darker, but overall pretty close to that we got before. Nothing has been added to this human figure, though the JP logo on his right arm has been removed for some reason. His arm chop action is still a solid feature, though it only works on smaller prey. The tall and handsome Tracker makes for a good addition to the small team of human figures of this toy line, but otherwise there's little worth of interest to him, since the Baryonyx is definitely the biggest draw of the set. After all, this line is all about the dinosaurs, eh? Repaint: yes. This is a repaint of the original TLWS2 Baryonyx, including that figure's capture gear repainted, along with a TLWS1 Peter Ludlow repaint, including all of Ludlow's accessories save for the Raptor hatchling. Neither the Bary nor Ludlow would be repainted for later toy lines (though Ludlow's head would also be seen on an Ajay repaint in the Stegosaurus with Dinosaur Hunter set of Wave 2 of this toy line, which also featured a single brown Baryonyx figure). Overall rating: 7/10. A decent set, with an effective and appealing, though not very original, paint job. This set is definitely harder to find than most other JPD1 Wave 1 releases, especially in MOC or complete condition. It probably will require a fair amount of patience and cash to acquire it.